It’s funny how things in life work out. 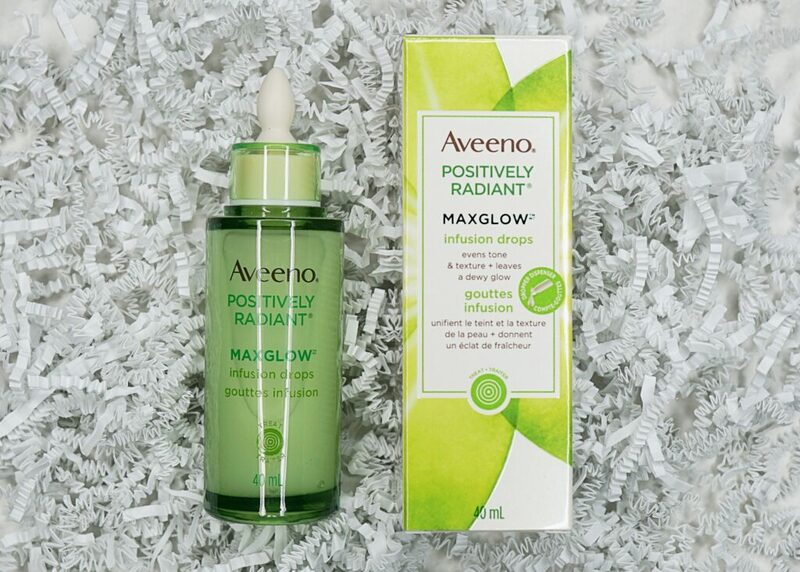 Last week I went to Shopper’s Drugmart and I was going to purchase the Aveeno Positively Radiant MAXGLOW Infusion Drops but I decided against it because I hadn’t done enough research at that point to see if this product would be ideal for me. At the time I regretted not purchasing it, but now I’m glad I didn’t because I received an amazing box complimentary from ChickAdvisor with products from Aveeno’s new Positively Radiant MAXGLOW collection. 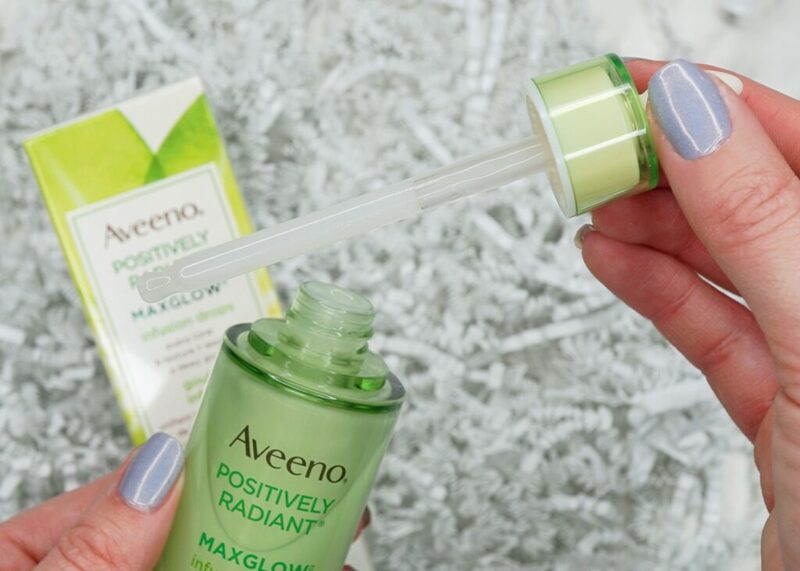 The first product I received was Aveeno Positively Radiant MAXGLOW Infusion Drops. These infusion drops are said to give your skin 48 hours full of moisture and a “glow within”, while also evening out your skin tone and texture with the help of a total soy complex. They can be used alone or with moisturizer. These Infusion Drops aren’t your typical serum that looks like an oil, it’s more of a creamy serum. The bottle itself is so pretty, and looks high quality. It comes with a dropper applicator, which I find helpful to get the right amount of product you want. I do enjoy a pump style better (just so I don’t have to worry about anything getting mixed into the product [dust, bacteria, etc]), but I can’t really complain about this dropper. It works how it’s intended to and you’re able to control how much product you want better than a pump style bottle. I, personally, don’t see a difference in my skin after using it for about a week. 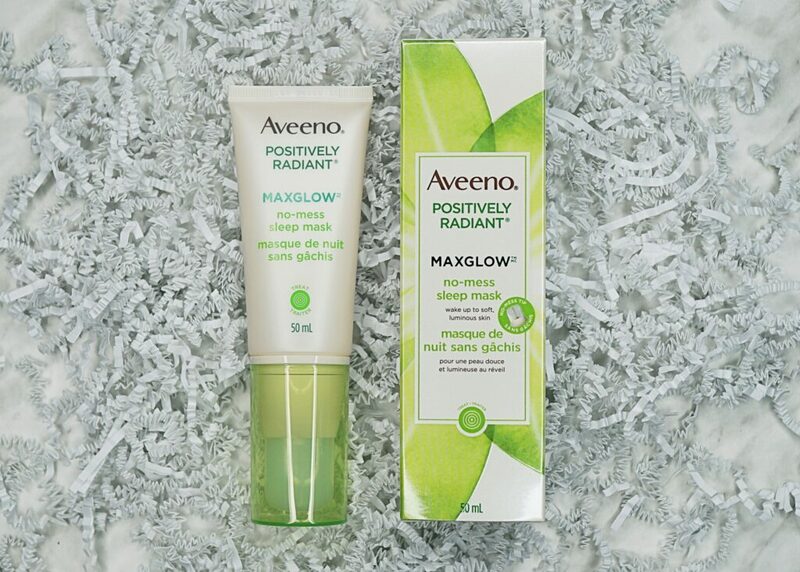 I definitely don’t see a “glow” in my skin, even when used by itself or mixed with a moisturizer. I do really enjoy the scent, and perhaps over time I will see a difference, but there has been no immediate difference thus far. If you know me, then you’ll know I love nothing more than to take off my makeup at the end of a night and give myself a mini facial. I was so happy to see the Aveeno Positively Radiant MAXGLOW Peel Off Mask included in my package. There’s something about peel off masks that are so satisfying.. maybe it’s the feeling of removing dead skin and dirt, or it could bring me back to my childhood when you’d put white glue on your hand, let it dry, then peel it off haha. Either way, I will never get bored of using peel off masks. 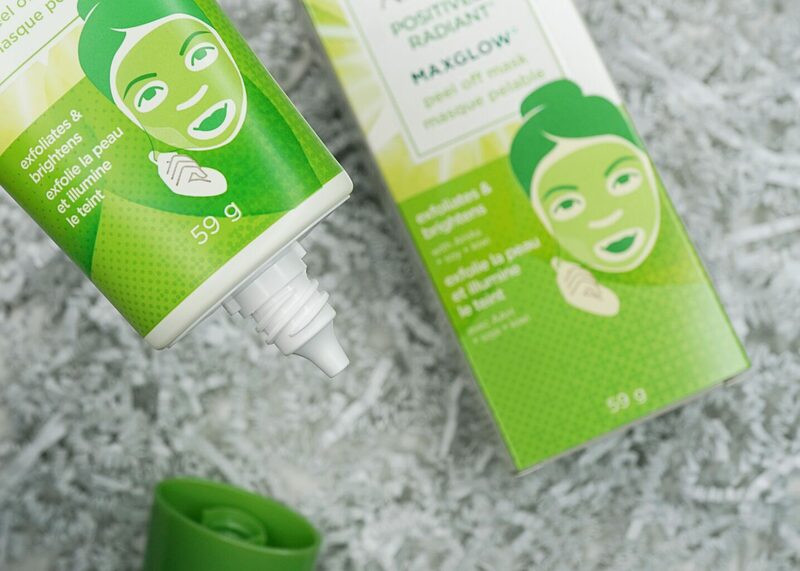 This Peel Off Mask is a soap-free, non-rinse exfoliator infused with alpha hydroxy acids, soy and kiwi complex that lift away dull, tired skin. If you watched my Instagram Stories, I documented my use with this mask. The directions say to apply a generous layer and let it dry for 15-20 minutes. I applied it with a brush and it went on super thick and tricky to apply. While it was drying, it almost “melted” down my face in some spots and I was skeptical about it drying quickly. Well, it took 30+ minutes to finally dry, but was surprisingly easy to peel off. I didn’t notice any difference in my skin again, other than it turning red from being irritated. I wouldn’t repurchase this peel-off mask, or recommend it. Sleep masks are relatively new to the beauty world, so it’s not something I’m totally sold on just yet. I’m not sure if they’re just a thicker moisturizer that takes longer to set into your skin and leave a residue behind to “lock in the moisture”, hence the reason to wash it off in the morning. Aveeno Positively Radiant MAXGLOW No-Mess Sleep Mask helps replenish moisture and even skin’s tone and texture, much like the Infusion Drops are said to do. With their no-mess paddle applicator, it helps your hands stay clean while applying. I usually apply my face masks with a brush, so I don’t worry about my fingers getting dirty, but this built-in applicator only meant less cleanup for me! I think of all the products that I received, this one is my most mixed review. The paddle does what it’s supposed to, but it just doesn’t work well with me. It’s hard to get an even layer on your face, and super tricky to use around the grooves of my face (nose, chin, around eyes). I ended up going around my face with my fingers to spread it evenly. It dried within 20 minutes and wasn’t noticeable any longer. The other problem I faced was that I ended up scratching my nose about 30 minutes later and noticed the sleep mask was rubbed off in the process. I thought perhaps because it was still “fresh” that it was doing this, but in the morning my face looked like I had dandruff all over it! It even got in my hair line and wasn’t super easy to wash off – I had to use a face cloth to make sure I got it all off. Now, the good news.. my skin actually looks and feels SO moisturized. It’s been about 4 hours since I woke up and it still looks great, even with makeup over it. Is the hassle worth the end result? 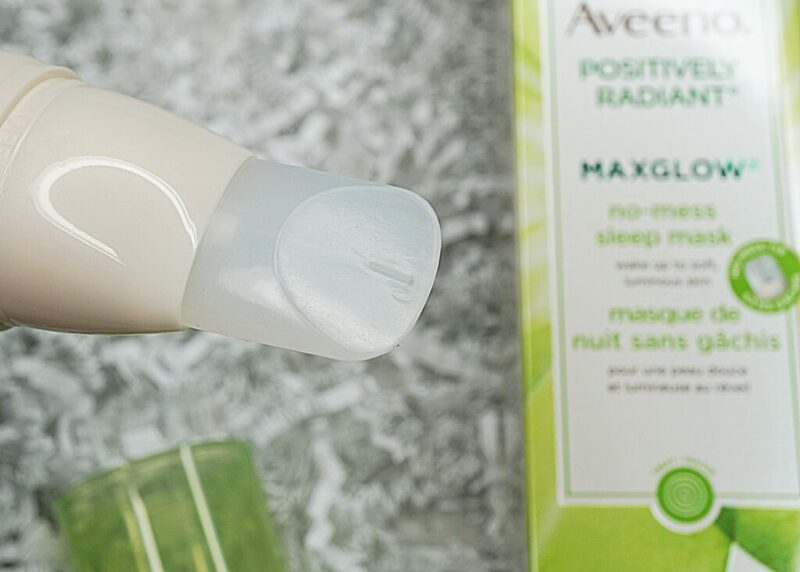 All the products in the Aveeno Positively Radiant MAXGLOW collection are made with Active Naturals Kiwi Complex, which turn skin into a moisture magnet by attracting and locking in moisture. These are great when you’re dealing with dry skin and need to keep your skin fully hydrated. They’re also hypoallergenic, paraben-free, phthalate-free and non-comedogenic. I did notice my skin to be more hydrated after using the sleep mask (but I wouldn’t want to use it again because of all the peeling). I did enjoy the scents and the range of products from this collection, but I would not buy any of them again. 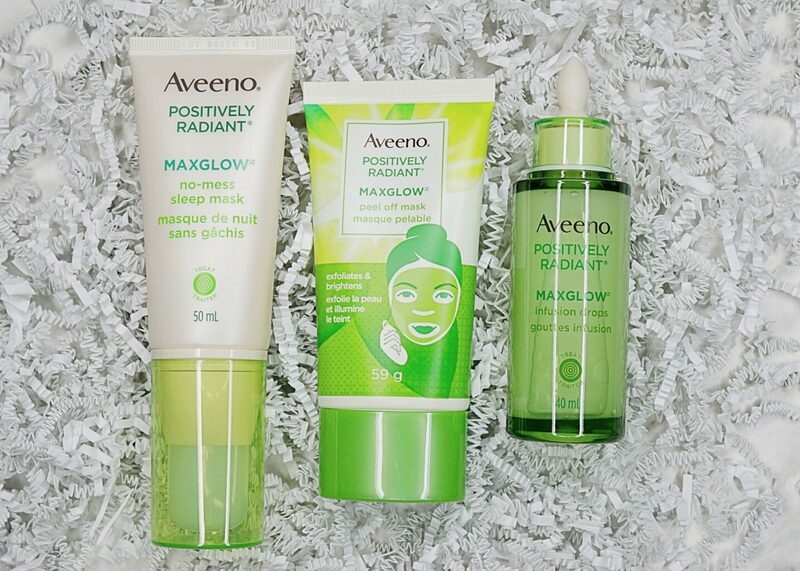 I did notice that Aveeno also has a Primer + Serum and a Micellar Gel Cleanser in this same MAXGLOW collection, but if they work anything like these 3 products.. I would not purchase. I didn’t see a huge difference in my skin, and they were a bit of hassle to actually apply. 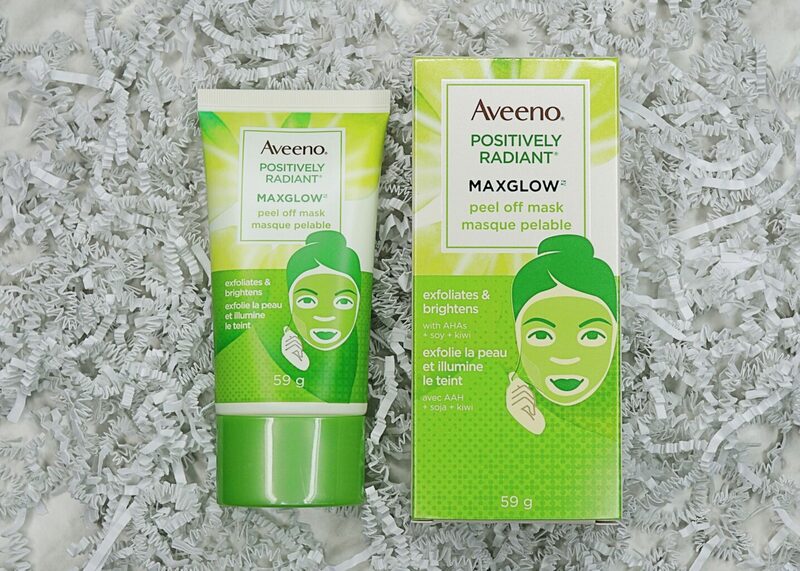 What are your thoughts on Aveeno’s Positively Radiant MAXGLOW Collection? I received these products complimentary from ChickAdvisor.